With the Deluxe Dual Keg Kegerator Conversion Kit, Kegco has drawn on years of beer dispensing experience to help you build an impressive draft beer dispenser packed with high-quality parts and convenient features. 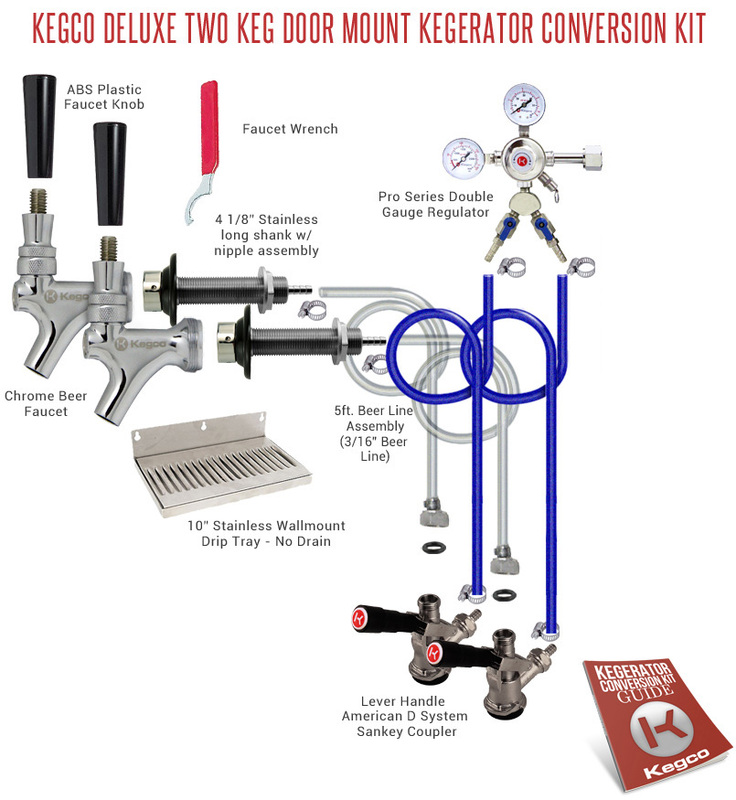 This kit comes complete with everything you'll need for a successful conversion process, including a durable pro series dual gauge regulator and NSF-approved commercial grade American D system keg couplers that will tap any North American store bought kegs. We've even thrown in a stainless steel drip tray that collects drips and spills to take some of the hassle out of cleaning up. Each of our kits comes with a detailed instruction guide, and our knowledgeable product specialists are on hand at 1-800-710-9939 for troubleshooting. Durably constructed to deliver a consistent flow pour after pour, this two product commercial grade double gauge regulator features a T-style adjustment valve that makes it easy to adjust the pressure inside of the keg. The gauge on top of the regulator indicates CO2 pressure in the keg, while the gauge on the side indicates the remaining volume of CO2 gas. Includes a y splitter and two independent shut-off valves for dispensing up to two kegs at the same keg pressure.